Police in Paris have fired rubber bullets and tear gas as a fourth weekend of anti-government protests across France turned violent. Almost 1,000 people have been taken into custody nationwide. Parisian hospital authorities said 126 people had been injured in the city, but none seriously. At least three police officers were also hurt. An estimated 125,000 demonstrators gathered across the country during the day, with 10,000 of them in the capital, where the scenes were the most destructive. Looters have been seen smashing shop fronts, and cars have been set on fire. In a television address on Saturday evening, Prime Minister Edouard Philippe said the "casseurs" (troublemakers) were still at work. He called for more communication between the government and protesters to resolve the conflict. "The dialogue has begun," he said. "It is now necessary to rebuild the national unity." Some places also had separate climate change marches taking place. There have been a number of confrontations in the capital. Video footage showed one demonstrator being hit in the torso with a rubber bullet while standing in front of a line of police with his hands up. At least three members of the press were also hit. As night fell, protesters converged on Place de la République, and a heavy police presence remained on the Champs-Elysées. Nearly 90,000 officers were deployed countrywide in anticipation of clashes, including 8,000 in Paris where 12 armoured vehicles were also utilised. 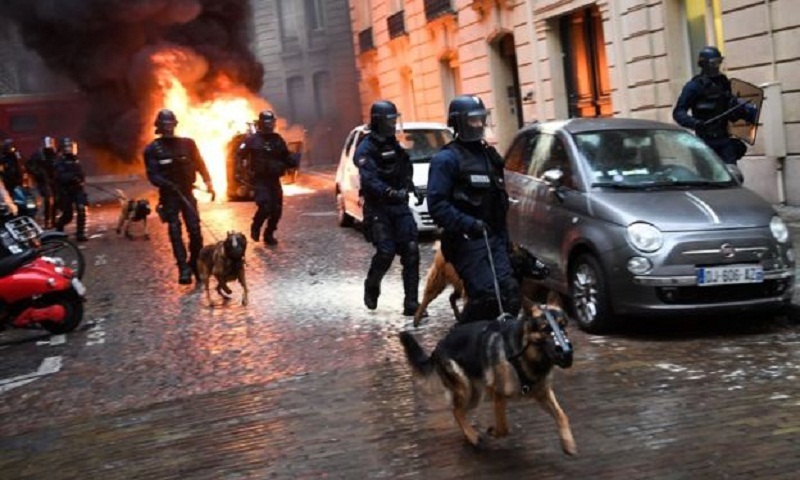 Last week, hundreds of people were arrested and 162 were injured in violence in Paris - some of the worst street clashes in the French capital for decades. This weekend, six matches in the top tier of France's football league were postponed. The Louvre, Musée d'Orsay and other sites were also closed all day in Paris. Over the past few weeks, the social media movement has morphed from a protest over fuel prices to a leaderless spectrum of interest groups and differing demands. Its core aim, to highlight the economic frustration and political distrust of poorer working families, still has widespread support. Meanwhile, President Emmanuel Macron's ratings have fallen to 23% amid the crisis, polls suggest. Some of Mr Macron's critics call him "the president of the rich"